﻿ How to Test a XFP Transceiver? After installing the XFP transceiver, testing its performance is an essential step. How to test it? You may get the answer on this article. There are four steps in testing an XFP transceiver (As shown in the following picture), which mainly includes the transmitter testing and receiver testing. 1. The input signal used to test the transmitter must be good enough. 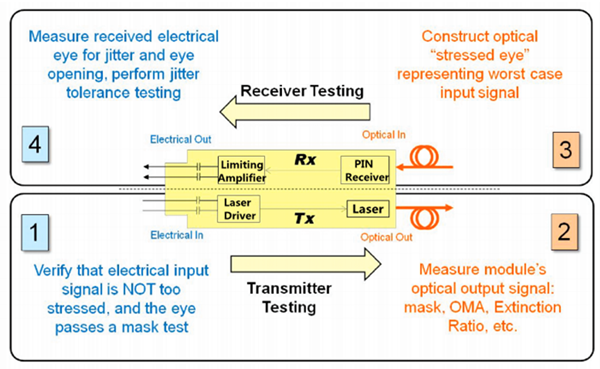 And also need to confirm the quality of electrical measurement by jitter measurement and eye diagram measurement. Eye diagram measurements are common ways to check transmitter output waveform, because eye diagram contains abundant information, can reflect the overall performance of the transmitter. 2. The optical output of the transmitter must be tested using several optical quality metrics such as eye diagram test, OMA (optical modulation amplitude), and Extinction Ratio. 3. Unlike testing the transmitter, the quality of the optical signal must be poor enough when testing the receiver. All in all, testing a optical transceiver is a complex job, but it is an indispensable step to ensure its performance. Fiberland provides all kinds of transceivers, which can be compatible with many brands, such as Cisco, HUAWEI, ZTE, Allied Telesis, HP, Brocade, DELL, Juniper. In Fiberland, each transceiver will be tested to ensure our customers to receive the products with superior quality.